Whether you’re an experienced stargazer or are looking for your first telescope, our range of Meande telescopes is the perfect place to find a high quality product that’s excellent value for money. 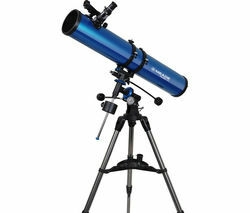 A Meade telescope is an excellent investment. Renowned for manufacturing some of the most impressive products in the industry, Meade have an enormous amount of experience and have developed themselves into one of the most trusted and respected brands around. Our range includes products on both equatorial and altazimuth mounts, with focal ranges varying from 700 mm to 1000 mm, and eyepiece magnification strengths of up to 200x. The diversity of our stock means there’s something for every type of user, and that you’ll always be able to find a Meade telescope that meets your exact specifications. Perfect as a gift, for education, or for pleasure, Meade telescopes are a fantastic way to learn more about the night sky, explore the wonders of the universe and experience many of the most impressive celestial events up close and personal. The Meade Infinity Refractor Telescope is one of our most popular products in the range and is largely representative of what you can expect from a Meade Telescope. 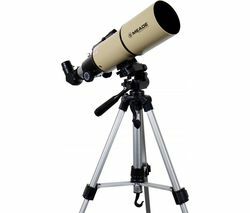 Packaged with a Bonus Autostar Suite Astronomy Planetarium DVD to help users identify more than 10,000 celestial objects, as well as a slow motion control rod for following moving objects and two eyepieces, it’s the perfect beginner telescope. Our telescopes are suited to both celestial and land use, and can be combined with a variety of other products and accessories. For instance, we stock an incredible array of binoculars for those that require greater portability. Customers can also check out our range of camera bags if they require lightweight but durable cases for their binoculars, cameras or other accessories.